Abstract: The Shuttle AK35GTR Version 2.2 is a new board all together and this time it's based on VIA's KT333 chipset. H'mm.. think you've seen this motherboard somewhere before because AK35GTR just sounds way too familiar? Well, why we really like Shuttle we are not reviewing the same motherboard again, the Shuttle AK35GTR Version 2.2 is a new board all together and this time it's based on VIA's KT333 chipset. We were very impressed with the 'original' AK35GTR we reviewed a month or two ago, it was very fast and was a great value considering all the onboard features that version had. The question this time is whether the AK35GTR V2.2 is worthy of the AK35GTR name! Not much has physically been changed on the Shuttle AK35GTR V2.2 other then really the VIA chipsets. The two boards are almost identical. That's not necessarily a bad thing if we consider that the original AK35GTR was a good performer with a proven design and was generally easy to work with. 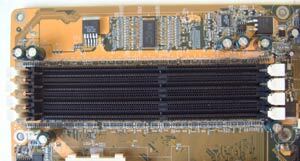 All the engineers may have had to have done was swap out the chips, making a brand new board in the process. Unfortunately the Shuttle AK35GTR is not available for retail sale yet so we're not sure how much it will be, but we're pretty sure it will be between $200-$225 CDN. The AK35GTR Ver 2.2 is very well equipped with a 4x AGP slot, six PCI's, four 184-Pin DDR DIMM's, onboard C-Media hardware sound and onboard Ultra/133 IDE RAID. 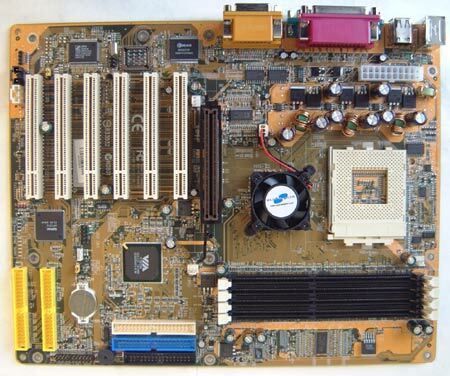 There isn't much more you could ask for in a motherboard! Sure USB 2.0 would be nice but that's about all I can think of at the moment. In general the layout of the AK35GTR Ver 2.2 is pretty good, even though the ATX power connector is near the USB 1.1 ports, at least it's near the top of the board. We were very happy to see that Shuttle decided to the C-Media 8738 sound chip instead of VIA's AC'97 CPU sapping codec. With true 5.1 audio quality on par with a Sound Blaster Live! 5.1, you no longer have to purchase a PCI soundcard! As usual, I didn't like the placement of the IDE connectors. With both of them on the lower half of the board, you can only use full length cards in the fourth and fifth PCI slot without potential interference. It's possible to use one in the sixth as well, however you'll have a hard time with IDE cables if you also use the Highpoint IDE controller with ribbon cables wrapping around devices. As you can see, there are four DIMM slots very closely packed together to the right of the CPU socket. Stability was an issue with all four DIMM's occupied with the most aggressive memory timings used. Relaxing the timings helped, but to run stable we had to use the most conservative memory settings which isn't exactly great for performance. This problem only happened with a fourth DIMM installed though. Alas the price we pay for motherboards with six PCI slots is that you have to remove the videocard if you want to add or remove RAM. Not really that big a deal especially, if you have six PCI's. The new AK35GTR uses VIA's new VT8233A southbridge which is the same as the older VT8233 except the new A version has support for Ultra/133 harddrives. The board also comes with onboard Ultra/133 IDE RAID which uses the Highpoint HPT372 chipset and can do RAID's 0, 1 and 0+1. If you don't feel like "RAIDing" your harddrives, then it can also be used as an IDE controller as well.